The Tokyo Sogo Management Advisory Group traces its roots to Sadao Takahashi, a licensed tax consultant, who founded an accounting firm in July 1965. From these beginnings in Kawasaki City, Takahashi and other licensed tax consultants formed MST Consultants, which participated in KPMG. In July 2002, reflecting its differing business philosophy and service policies, the Group split off from KPMG through a management buyout and became an independent enterprise. 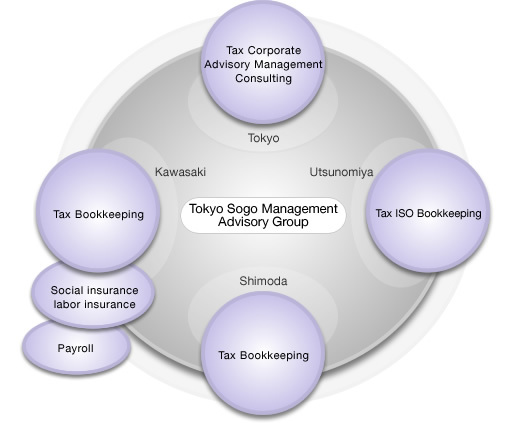 The Tokyo Sogo Management Advisory Group mainly offers outsourcing services related to accounting and taxes using the expertise it gained from KPMG and provides tax-related advisory services to medium-tier companies. The Group's senior partner has 40 years of practical experience as a licensed tax consultant and he is assisted by several professionals, including certified public accountants, licensed tax consultants, and management consultants, who pursue strategic initiatives in their respective core fields. These professionals provide outsourcing services in accounting and taxation as well as consulting services in financing and marketing. The Group is expanding into diverse domains using its accumulated know-how and has the means at its proposal to meet a full range of client needs.